If someone ever compiles a primitive surf compilation album I'd be more than a little surprised if "Surfer's Mood" was not allocated a slot. 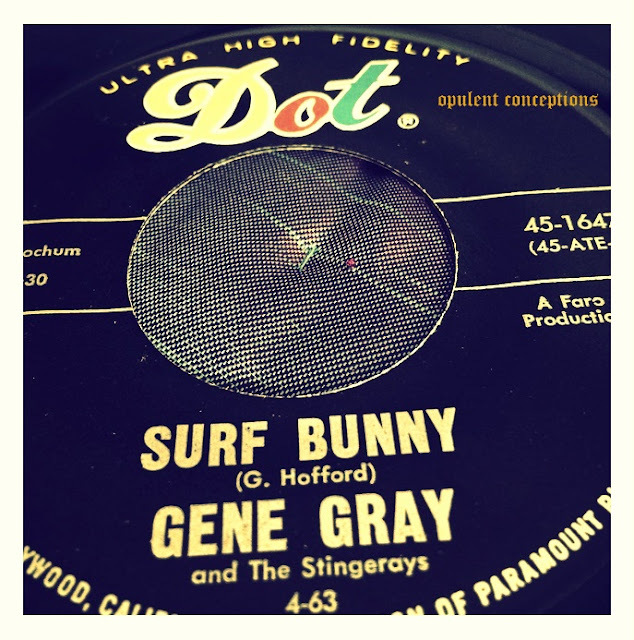 On the latter recording, Gene Gray & the Stingrays sound like a surf garage band that would be at home on a "Back From The Grave" comp. Yeah, it's that primal. The other side "Surf Bunny" is my pick though. My cat "Biba Ringo" digs it a whole lot. As I'm cranking out this 45 on my turntable at volume "11" she's banging away on a couple of coconuts and showing her teeth. The single first appeared on Linda Records then it was picked up by Dot for a wider distribution.